I've always felt incredibly lucky to have grown up and lived on the west coast... for most of my life. Extreme winters and humid summers just aren't for me. Until I moved to the Pacific Northwest, I never owned a proper coat. As a child in Southern California, I rode my bicycle nearly every Christmas day, sometimes with my newest sweater or sweatshirt on... sweating profusely, but happy. And now that I do experience, more or less, proper seasons... far more distinct than as a child... I have grown to love the changes... never too drastic to uproot the soul. And... always fruitful. This is something I definitely took for granted until I lived elsewhere over the years. Fruit wasn't always fruitful. During these periods in my life, if the weather didn't try to get you down, the lack of fresh fruit did. Good fruit, however, is available quite readily in the Pacific Northwest... thankfully. And, in summer, it's bountiful!! Popped into shakes, diced into cereals, churned into sorbets and ice creams, cooked into jams... and grilled to top salads. Just when you think you might have had enough, you find another way to enjoy them. 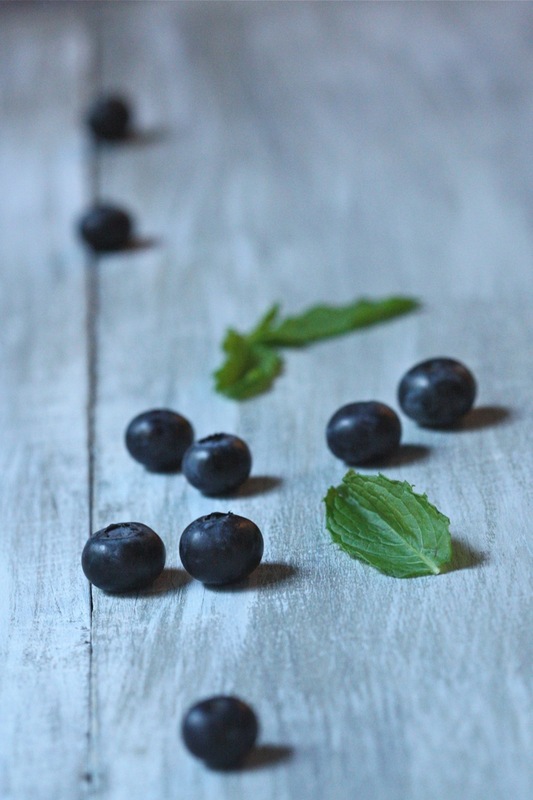 This salad came about after a friend casually mentioned a nearby farm for fresh blueberries and a salad she recently had that incorporated these brilliant little gems. They really are a perfect pop of sweetness for a salad of baby greens. And with so many beautiful stone fruits now abundant in markets, what could be more perfect? Grilled sweet, ripe peaches and apricots not only balance the flavor of blueberries... beautifully... they are also a perfect color coordinate! And... to play along with the sweet, fresh, mellow flavors of this salad... a pop of crisp jicama and a drizzle of honey-mint-lime vinaigrette. We are so lucky to have such a bountiful bevy of fruit at our disposal... it definitely nurtures the soul... like a childhood bike ride on a warm December day... and it's pretty good on a salad, too. Combine approximately 1 teaspoon olive oil and 1/4 teaspoon of honey; whisk until well incorporated. Lightly brush cut sides of fruit with sweetened oil; set aside. In a small bowl, combine juice of one lime with 1 teaspoon of honey; whisk well to combine. Add approximately 2 tablespoons olive oil, fresh mint and pinch of salt. Whisk vinaigrette to combine, taste and adjust to your preference (more honey to sweeten, more lime to brighten, etc.). Set aside. Lightly brush grill pan with some olive oil and place over medium high heat to warm. After about 1 minute, place peach and apricot halves on grill pan (flesh side down) and cook for approximately 3 to 5 minutes, until lightly seared and warmed through. Transfer to cutting board when done. Slice peaches (and apricots, if desired). Set aside. 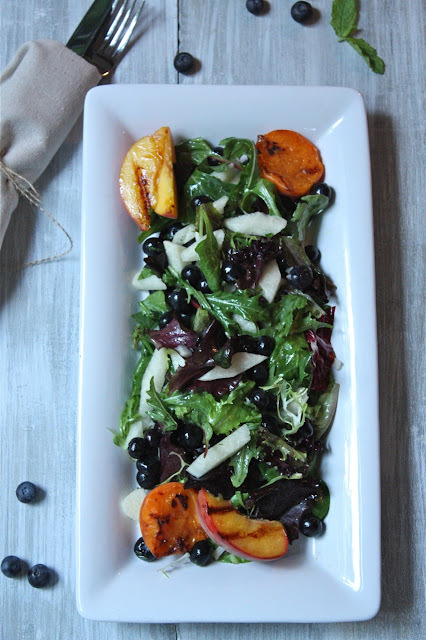 In a large bowl, toss greens, diced jicama and blueberries; lightly dress with vinaigrette. 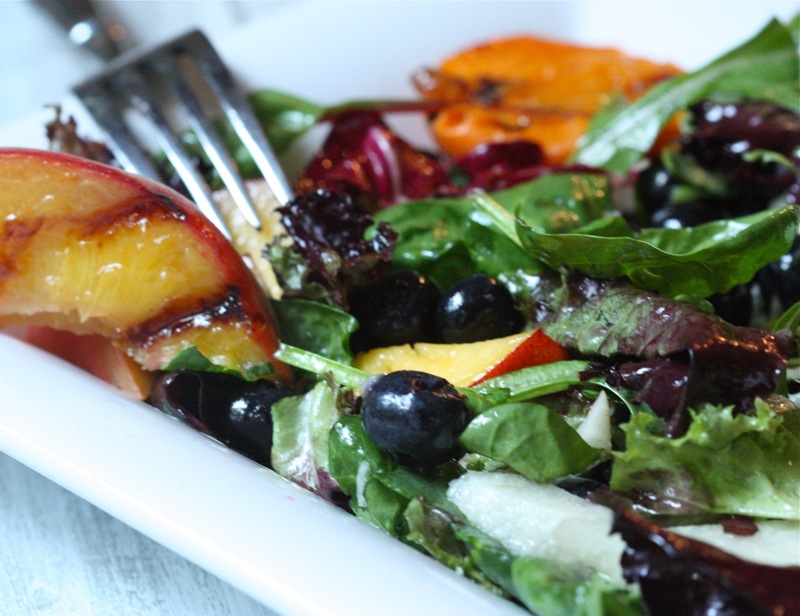 Transfer salad greens to serving plate and arrange grilled stone fruit alongside. Serve immediately.